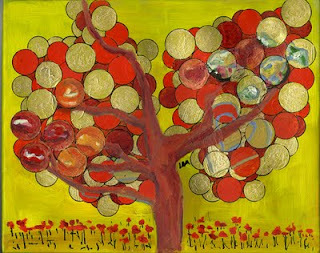 Circle Tree is my latest oil on canvas, measuring 8"x10"x1". 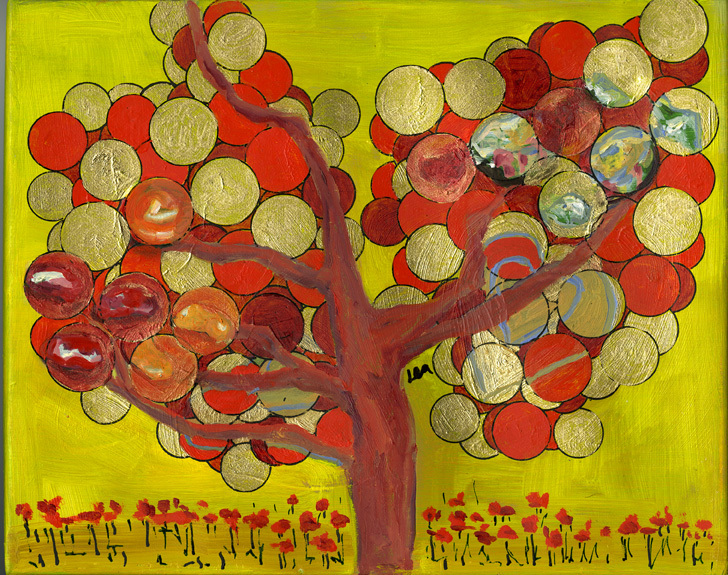 At first I tried painting candy in the style of Wayne Thiebaud with no success so I painted over most of my crummy attempt and drew circles over the rest using my Kern mathematical instrument set. I then painted in some of the circles with Schmincke's Bronze powder, which creates a rich pale gold color that glitters nicely in the sunlight. I've had the Kern set since childhood. It must have been one of many odd items E.A. Autrey acquired at an auction or Bekins sale in Santa Barbara years ago. The one I have looks just like the one manufactured between 1914 and 1926, as seen via the Kern & Co. link above. It is amazingly useful as an artist's tool.